Located in the very desireable city of Woodridge, The Condominium Residences at Seven Bridges is simple to find. We've created the easy-to-follow directions or get custom directions from your exact location at Google Maps. Take I-355 south toward Joliet, take the Maple Ave. exit and turn left at IL-53. Turn right at Mulligan Dr. Then take a slight left at Double Eagle Dr. and continue to 6420 Double Eagle Dr.
Take I-90 west to I-290 to I-88 west to the IL-53 south exit. Merge onto IL-53 and turn right at Mulligan Dr. Take a slight left at Double Eagle Dr and continue to 6420 Double Eagle Dr.
Take I-55 to I-355 north, exit at 75th St. and turn left at 75th St. Turn right at IL-53 and take a left at Mulligan Dr. Take a slight left at Double Eagle Dr. and continue to 6420 Double Eagle Dr.
Take I-88 east to I-355 south, take the Maple Ave exit and turn left at IL-53. Turn right at Mulligan Dr. Then take a slight left at Double Eagle Dr and continue to 6420 Double Eagle Dr. Compare floorplans for any of ten spacious floorplans. One of the best parts of living at The Condominium Residences at Seven Bridges is that it is at the heart of one of the finest locations in Woodridge. You’re within walking distance of the shops and casual and fine dining at the new main Street at Seven Bridges, as well as nearby amenities and the Seven Bridges golf course. 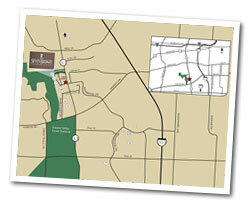 Our convenient Community Map shows you just how close you are to the area's many attractions.